You may have heard of the term "mindfulness" discussed in the popular media. So, what is it? 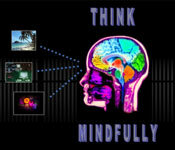 Mindfulness entails concentrated awareness of one's thoughts, actions or motivations. Mindfulness involves continually bringing one's awareness back into the present moment. By residing more frequently in the present, one begins to see that the mind is continually chattering away with commentary and judgment. By noticing what the mind is offering up, one gains the ability to observe their thoughts and to see them for what they are without fear or judgment. Those practicing mindfulness come to realize that "thoughts are just thoughts". One is then free to let their thoughts go because they no longer reflect reality or truth. Think about watching a child play. See how absorbed they are in what they are doing? That's a good example of what mindfulness is. It is being totally absorbed in the "now".